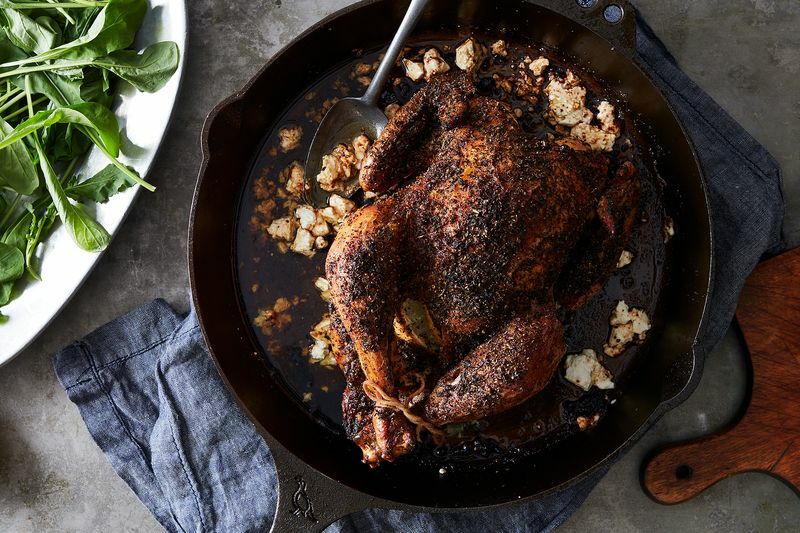 There are many of us—most famously Julia Child—who would call a simply roasted chicken a perfect food, one that’s hard to imagine improving upon. 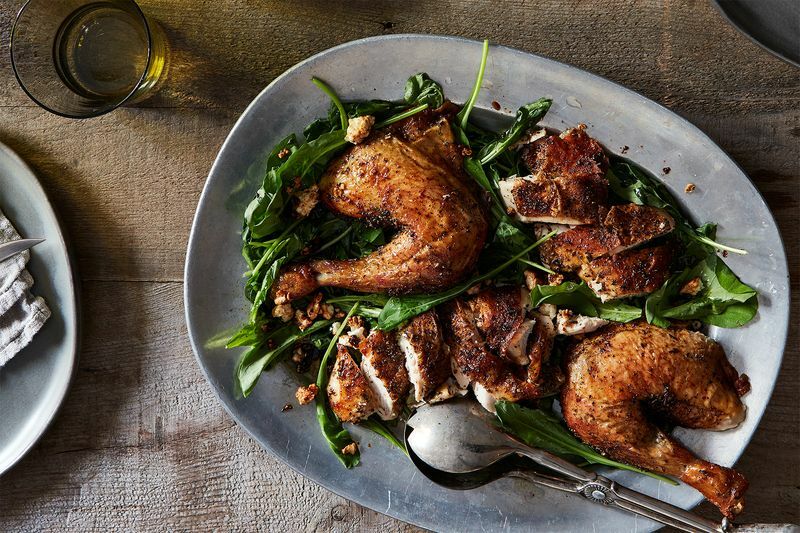 How many superlatives can we heap on one meal—a perfect roast chicken, made ... perfecter? 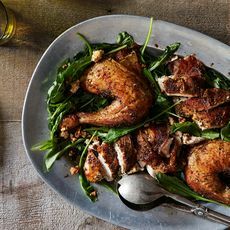 But, like most things in life, roast chickens don’t only exist in a linear hierarchy from good to best, and while sometimes you want the simply-seasoned perfect bird like Julia did—“Even a perfectly simple, buttery roast should be a delight.”—sometimes instead you want an herb-crusted, crackly-skinned, salty-briny-juicy pop-in-the-mouth perfect bird. This week’s genius recipe is the latter. And it comes together in five-ish ingredients, in a surprisingly simple, brilliant way. Melissa Clark, whose most recent cookbook (her 38th!) is Dinner: Changing the Game, also publishes smart, usually weeknight-friendly recipes in her column in The New York Times every week. 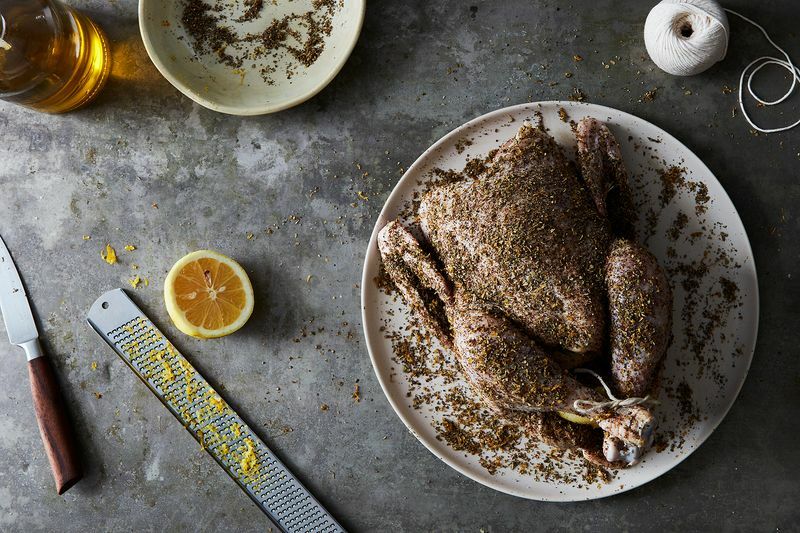 When she launched this feta-brined roast chicken recipe there in January 2015, it stirred up even more than the usual praise and intrigue around the internet. 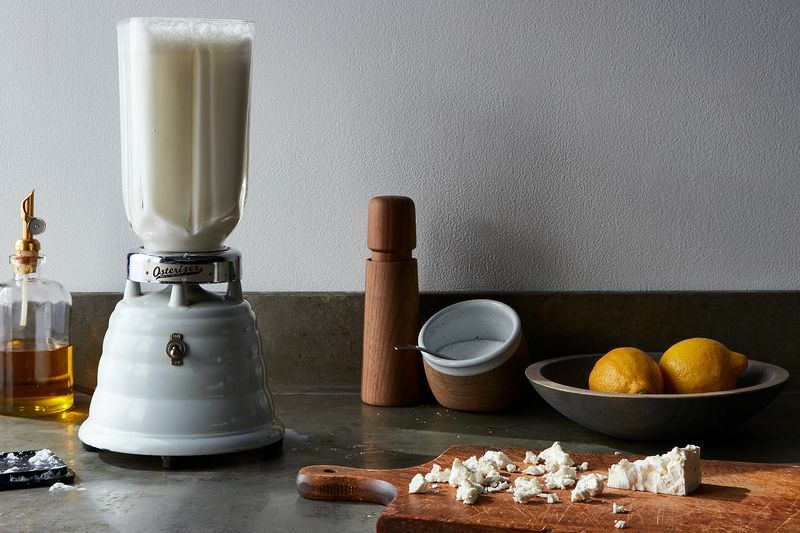 In this thread on the Food52 Hotline, there was a small frenzy. The recipe's most memorable quality is announced right in the name: Clark soaks the chicken in a feta-flavored brine. As in any wet brine, this seasons the meat and helps keep it juicy, but here it draws the rich, brightly feisty flavors of feta inward, too. This technique was inspired by the chicken served at Souvla* in San Francisco, where the kitchen makes use of the actual leftover brine drained from wholesale-sized tubs of feta. But since feta brine supplies in most households are less consistent, Clark simply blends some crumbled feta up into a standard salt and water brine. Ta-da! Feta-brined chicken. This is a brilliant move, and it will change your behavior around the brine dregs in your fridge—but it's not where the genius of this recipe ends. Clark also starts the chicken in a searing-hot skillet before sending it ovenward, for a browner, crispier underside, and a jump-start on the cooking time. And while I’m usually anti-trussing, thanks to the no-nonsense training of Barbara Kafka, here it works well to corral several lemon halves in the cavity (though if you don’t have twine, or don’t feel like trussing—or if, say, you tried to jimmy the legs together with toothpicks like I did one time and they forced themselves open partway through cooking anyway—your chicken will also be fine). But most of all, it’s Clark’s alchemy of assertive Greek flavors that gets me: the lemon zest, piney dried oregano, and a ton (up to two tablespoons!) of craggy black pepper caked onto the bird before roasting, plus more lemon juice and crumbled feta that softens a bit as it hits the hot, chickeny pan juices. I could drink this elixir, but instead it gets spooned warm over a pile of greens to become the best salad dressing you could imagine. Clark recommends serving with a side of roasted potatoes. There, for Julia, you can keep it simple. *Souvla's chicken appears to be served on sandwiches and salads with something called "Granch" dressing. This article was written by Kristen Miglore from Food52 and was legally licensed through the NewsCred publisher network. Please direct all licensing questions to legal@newscred.com.